The Central Tradition, almost as old as the trucking industry itself, is a simple one. First, find energetic and dependable people. In many cases, they're the same outstanding employees and upper management your business has been depending on for many years. That kind of long-term employee is commonplace at Central. We have been making your pickups and deliveries and providing millions of miles of accident-free service for over 88 years. 2013 Central Freight expands into Tennessee and Wisconsin new terminals in: Nashville, Chattanooga and Milwaukee with the acquisition of Circle Delivery of Tennessee. 2006 Central transitions from a publicly traded company to a privately held enterprise by a merger with North American Truck Lines, LLC and Green acquisition Company, controlled by Mr. Jerry Moyes. 2004 For the fourth time, Central wins the prestigious ATA President’s Trophy. 2003 Central Freight Lines goes public. 1999 Central signs contract to acquire Intrastate Arizona Carrier, Jaguar Fast Freight. Central continues westward expansion into California and Nevada with purchase of Vecta Transportation Systems, Inc. of Sacramento, California. 1997 On June 30th, an investment group led by a group of senior Central management purchases selected assets of the former Central Freight Lines from Viking Freight and reopens as a new Central Freight Lines. 1996 Central becomes the Southwestern Division of Viking Freight, Inc.
1995 On January 1, federal legislation deregulates intrastate common carrier trucking nationwide. Central is named the 1994–95 Regional LTL Carrier of the Year by NASSTRAC, a national shipper organization and traffic management industry trade publication. Joe Hall becomes Central's fifth president. On December 14, Roadway Services, Inc. becomes Caliber Systems, Inc. and on December 18, the consolidation of Central, Coles, Spartan, and Viking Freight Systems into Viking Freight, Inc. is announced, creating a nationwide freight carrier, and beginning the closure of Central's Waco corporate headquarters. 1994 Central expands into Colorado, Kansas, and Missouri. Later, Central expands into Illinois and Mississippi. 1993 On March 27, employee-owners and direct shareholders of Central approve the purchase of the company by Roadway Services, Inc. On April 11, Central officially becomes a part of Roadway and joins the Roadway Regional Group. Central begins service in Louisiana. 1992 Central expands to Arkansas, New Mexico, and Tennessee. Tom Clowe is named Central's fourth president. In October, Woody, Jr. and Diana Braswell retire, selling their stock to the Employees Profit Sharing and Retirement Plan making Central truly an employee owned company. On November 23, Roadway Services, Inc. and Central reach an agreement in principle for Central to be purchased by Roadway. 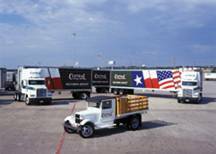 1991 Central receives 48-state interstate operating authority and expands into Oklahoma. 1990 Tom Clowe joins Central as executive vice president and chief operating officer. 1987 W. W. Woody Callan Sr .Chairman of the Board - passes away. 1986 Central employees honor Woody Callan, Sr. with a specially-designed 48-foot trailer. 1984 Central purchases Curry Motor Freight and Perry Motor Freight. 1984 Central receives the 1984 American Trucking Association President’s Trophy. 1979 Woody Callan, Jr., becomes Central's third president. 1952 R. H. Linam becomes Central's second president. An employee stock purchase plan is established. 1940 Central Federal Credit Union officially opens its doors. 1938 Central Freight Lines Dallas Facility becomes the largest freight facility in the world. 1929 The Texas Legislature establishes intrastate trucking regulations and the Railroad Commission of Texas. W.W. Callan has to separate Central Forwarding’s household goods moving business, which became known as; Central Forwarding, Inc., from the company’s general freight transportation known as Central Freight Lines, Inc.